Looking for Redding Real Estate? The interest in Georgetown's history has grown. I have been adding more and more to the Georgetown history section so keep checking back for updates. In 1999 I was blessed to receive a booklet of articles by Wilbur F. Thompson, from Irene Baldwin. Wilbur F. Thompson was a historian that those that live or have lived in Georgetown owe a great deal of gratitude to. Without his writings much of Georgetown's rich history would be lost forever. Thompson's writings inspired and fascinated me to such an extent that I have spent the past 10 years researching, recording and promoting the history of Georgetown. Included on this Georgetown History Homepage is the history of Georgetown as I have come to know it, there is still much more to discover, but as I'm sure you'll soon find...there's much more to Georgetown than you've ever imagined. Be sure to check out the "Topics of Interest" in the left navigation menu as well. Enjoy. Georgetown History- from Wilbur F. Thompson articles in the Irene Baldwin collection, additional information, maps and photos provided by Brent M. Colley. On the east bank of the Norwalk River, about 150 feet south of the house once owned by Mrs. Harriet Bates, later the Peckhams (Across the street from 140 Old Mill Road) there is an old boundary marker that according to local legend was the intersecting point of the north and west boundary lines of Norwalk and Fairfield. We have yet to locate the land records to confirm this. 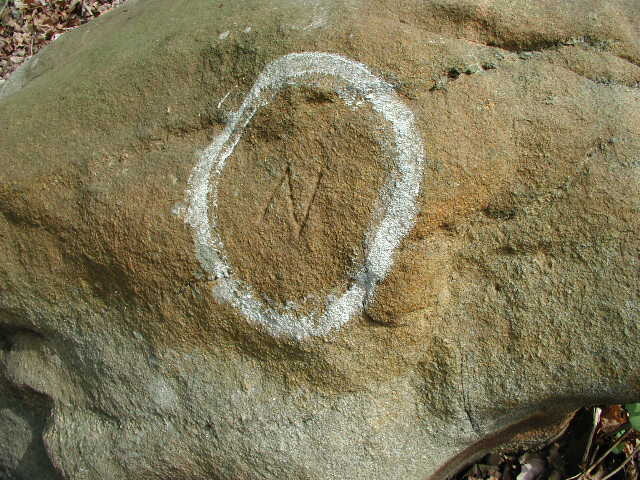 What is confirmed is that in 1707-08, when the Town of Ridgefield was surveyed, it was found that the east and south lines of Ridgefield met at this rock with west and north boundaries of Fairfield and Norwalk (Wilton). There was some dispute between Ridgefield and Norwalk (Wilton) about this boundary line location and as a result, some years later the Ridgefield/Wilton town boundaries were moved one mile farther north. The corner of Mountain Rd. and Peaceable St. is now the boundary between Wilton, Redding and Ridgefield. At the present day, this rock lies on the boundary lines of Redding, Wilton and Weston. On the rock there are three deeply cut letters: on the east side F for Fairfield(later Weston); on the south side N for Norwalk(later Wilton); on the west side R, for Redding. *The date of these cuts are still being researched, but it is believed that they were made after 1767. 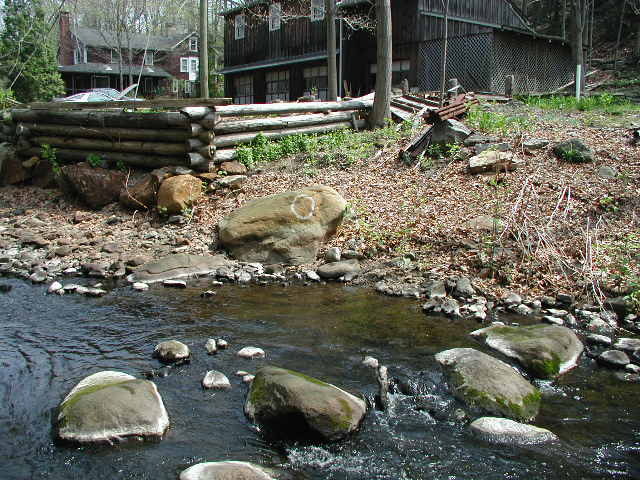 Let us read what the old record has to say about the rock- "Ye surveyors find that ye east and south boundary lines meet on a rock on ye banks of the Norwalk River, 20 rods north of ye Danbury Cart Path fording place. Ye bounds of Norwalk and Fairfield meet on said rock." Old Mill Road and Georgetown. The first settlers appeared in Georgetown between 1721 and 1756 building along the high ridge of land then known as Barnham's or Burnham's Ridge, later known as the Hog's Ridge. This ridge follows the line of Route 107 from Georgetown to Redding Glen with all the land in what is now the village of Georgetown in the towns of Redding and Weston. This was during the time of the first settlement in the northern part of the town of Fairfield. The old north boundary line of Fairfield was on or near where the highways now run from Redding Ridge to Redding Center and from there west to the Ridgefield line about two and one-half miles above the boundary rock located on Old Mill Road in the Norwalk River in Georgetown. The upper half of the town of Fairfield was surveyed into what was known as the Fairfield long lots. These lots were surveyed or laid out on what was known as the eleven o'clock line. They were of different widths, but were narrow when compared with their depth, which was eight or ten miles. They were owned by the early settlers of Fairfield near the tidewater, or were granted to persons for services rendered the colony or town in civil or military life; and were known by the names of the owners. Some of these lots were settled on by the original owners - others were settled on by persons who bought the land of the first owners. The long lots we are interested in are those that comprised the land now known as "The Village of Georgetown" located within the towns of Redding, Weston and Wilton. These were the Osborn long lot, Applegate long lot, and the Drake long lot. These lots traveled up from the Norwalk River and through the Boston District to Redding Glen which was known then as Nobb's Crook. The Boston District was an area that included the following present day roads: Mountain Road stopping just before Seventy Acres Road, Peaceable Street, Umpawaug Road stopping just before Topstone Road, Route 107 starting just about where the Nazzaro Bros. driveway is today and extending all the way to Glen Hill Road, all the roads along Rt. 107 in this stretch were included too: Beeholm Road, Farview Farms, Goodsell Road, Little Boston Road, Dorethy Road, Wayside Lane, Half of Dayton Road, Lee Lane. The first long lot in what is now the village of Georgetown was known as the Osborn long lot granted to Richard Osborn for military service in the Pequot Indian War. This was bounded on the west and northwest by the then Norwalk, now Wilton line and came to the boundary rock in the Norwalk River. This section is in the Weston part of Georgetown. It has been said that Richard Osborn built on the Osborn long lot at an early date but this has not been proven. The first settler we have record of who built on this section was William Osborn, who built a log house in 1734. Later members of the Osborn family built here, giving it the name of Osborntown. In 1721 Robert Rumsey of Fairfield bought of John Applegate a large tract of land known as the Applegate long lots. In 1724 he willed this land to his three sons, Benjamin, Isaac, and Robert. Benjamin and Isaac were actual settlers on this tract, and the former's estate was inventoried and distributed in 1744. Isaac built on the hill in front of where the Aaron Osborn house once stood. The location of the Aaron Osborn house was approximately where the Nazzaro's property is today which would make the house that Isaac built the first documented building on the tract of land we know as Meadow Ridge. Benjamin settled near the present location the Georgetown Package Store. "After a year and a half of this struggling, worrying, begging, scraping along without friends or funds, meeting one discouragement after another, brighter days dawned. We received the second dividend from our stock and the state finding us still existing, returned the inheritance tax, and we were able to draw a long breath, pay up our debts, and dream of putting the farm in such shape that we would cease to be ridiculed by the neighbors and to have to apologize for everything we had, and everything we did. We could make a start towards fixing things so there would be a little income, with a view to making the place self-supporting." Proof of Rumsey's settlement there came in 1856 when Samuel Main was building his house in that location, he started to dig a well. Uncle Timothy Wakeman asked Mr. Main what he was doing. On being told, Uncle Timothy took an iron bar, and striking it through the sod found a stone slab that read: "This is the old Rumsey well dug in 1726." Mr. Main uncovered and cleaned out the well and used it as long as he lived in Georgetown. Above the Rumseys other settlers built their homes. The Perrys, Mallorys, Morgans, Hulls, Lees, Darlings, Coleys, Bradleys, and later the Sherwoods, Battersons and Parsons all settled along this ridge which follows Rt. 107 from Georgetown toward Umpawaug Road and is known as the Boston District. The first settlement of the Drake lot, in that part of Georgetown in the town of then Norwalk, now Wilton was made many years later than that of the other sections. The reason being early settlers thought the lowlands were unhealthy and always chose the high ground first for building their homes. This section contains most of the present day village surrounding the Gilbert & Bennett Factory. Most of the land in this section was owned by John Belden, Solomon Wood and Ezekial Wood. In 1756 Noah St. John the 1st bought of Solomon Wood fifty acres of land, and built a home. His son Nehemiah St. John also built on this land. Nehemiah built the Matthew Gregory place later owned by Arthur Clark. The St. John farm remained in the family for many years and was later owned by the Rev. Samuel St. John. Later the Taylors, Olmsteads, Gregorys, Morgans and other families settled. In 1756 Solomon Wood sold the remainder of his land north of the St. John farm to James Morgan of Redding, who built a house on or near the site of the house built and long owned by Hiram St. John. In 1764 George Abbott, formerly of Salem, Westchester Co., Province of New York, bought of Ebenezer Slawson, of Norwalk, a mill privilege on the Norwalk River for the purpose of erecting a grist mill. The mill was built and he commenced to grind corn and grain. There is a tradition that John Belden had built a saw mill on or near the same site, and Abbott bought that too. 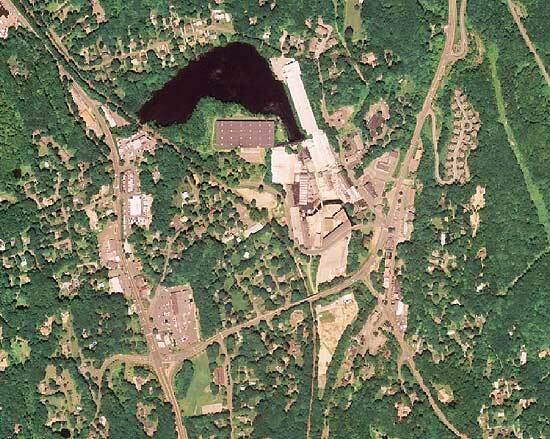 The mill was on the only road between Danbury and Norwalk and did a great business; people from miles around brought their grain to be ground, or logs to be sawed up into lumber. Abbott lived in a house that stood south of where the Waterman Bates house stood on Old Mill Road. His wife (called Aunt Lucy) kept a tavern or half-way house for the teamsters which was located on the Danbury and Norwalk turnpike (Old Mill Road). * Another "local legend" has Georgetown named for King George of England due to the number of Tories or Loyalists (18 families) living in Georgetown prior to the War of the Revolution. Several St. John's for example would leave the area after the Revolution. **Yet another "local legend" has a Blacksmith named "George" as the namesake. Philip Keeler of Ridgefield succeeded George Abbott as Georgetown's miller. The next owner of the mill was Stephen Perry, an ancestor of the late Nathan Perry (Perry's Market). He rebuilt the dam and mill; it was then known as Perry's Mill. Later Joseph Goodsell the 1st ran the mill. He was the father of Joseph B. Goodsell the 2nd, who lived on Goodsell's Hill and whose name appears on the 1867 Beer's Map of Redding. *On the west side of the Norwalk river in the ledge of rocks below the mill dam is what is probably one of the oldest grist mills in the state. It is a circular hole in the rock about two feet in diameter and four feet in depth; it is shaped like a round-bottomed pot. These holes are called pot-holes and were worn or made by the action of water ages ago. The Indians of long ago used them for grinding the Indian corn raised in the valleys; with a stone pestle the corn was soon reduced to a coarse meal called samp. The early settlers called them samp mortars. The use of stone pestles for years in these samp mortars made them deeper and larger. The first church organization in what is now the village of Georgetown was known as the Baptist society in Redding. The exact date of its formation is not known. In the records of the Congregational Church in Redding is found this entry: "Dec. 9, 1785, Deacon John Lee gives certificates to Michael Wood, John Couch, Micah Starr, Jabez Wakeman, to the Baptist Church in Redding." Follow link to read more. The Methodist Episcopal Church of Georgetown. The first circuit organized in New England. by Jesse Lee was called the "Fairfield Circuit." 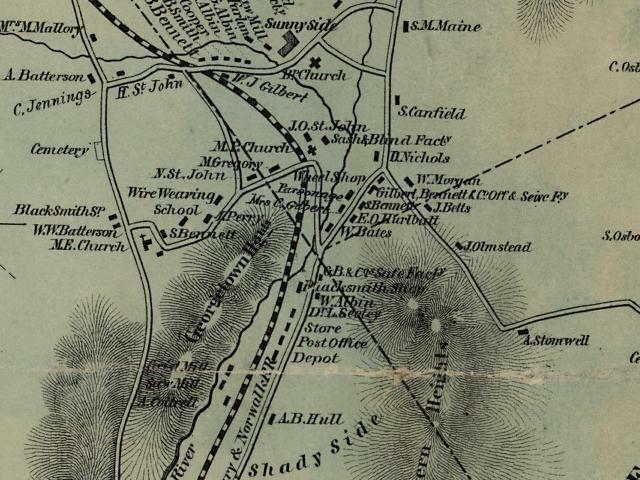 It included roughly the area from Norwalk, east to Stratford and Milford, then north and west to Danbury and. Redding, and south again to Norwalk. The Georgetown class was formed in 1790. For many years this group met at various homes, for it had no regular place of worship. Follow link to read more. Georgetown Bible Church, dates back to the early part of the nineteenth century when it began as the Methodist Protestant Society. In 1820, a Reverend William Stillwell organized another Methodist group in Georgetown. This followed a small schism in the New York Conference. This group adopted the name Methodist Protestant when it met in convention in 1829. This group was the forerunner of the Edwin Gilbert Memorial Congregational Church in Georgetown and later the Georgetown Bible Church. Follow link to read more. Sacred Heart Church. With the completion of the Norwalk & Danbury R. R., Catholics began to move in and settle about the halfway mark known as Georgetown. The spiritual needs of these families were taken care of by priests from both St. Mary's Church, Norwalk, and St. Peter's Church, Danbury. Holy Mass was celebrated in private homes both in Georgetown and Branchville. By the late 1870's, the number of Catholics had increased considerably, so the use of Bennett's Hall was secured for services. Follow link to read more. Covenant (Swedish) Congregational Church. This church, located on the old Weston Road now known as Covenant Lane in Georgetown, was founded in March 1889 by Swedish immigrants. The building was erected in 1891 with a parsonage on Maple Street. In March of 1964, they celebrated their 75th anniversary. Follow link to read more. Bethlehem Evangelical Lutheran Church. The Bethlehem Lutheran Congregation in Georgetown came into existence as a result of the deep longing in the hearts of the Lutherans in Georgetown at the turn of the century. In fact, pastors from the Seamen's Mission in Brooklyn, N.Y. had made visits to Georgetown as early as 1900. In the year 1907, local leaders had made contact with Pastor Torsten M. Hohenthal of the Seamen's Mission to visit Georgetown to administer communion to Mr. John Peterson. Follow link to read more. The Gilbert and Bennett Company can and should be credited with the growth and late settlement of Georgetown. G&B was the heart of Georgetown, creating & cultivating a community of industrious, religious-minded families, proud of their locality and willing to work together for the benefit their town and its people. Gilbert and Bennett began with products made from woven hair. Due to the nature of their business tanneries and slaughter houses had an abundance of hair leftover which was simply discarded at the end of the day. At that time, families made their own meal, sifting it from the bran through sieves made of horsehair. Benjamin Gilbert, perceiving a market, abandoned his tanner business and embarked in the manufacture of these horsehair sieves in 1818. *The invention has been called "the most humane contribution the 19th century made to the presenvation of sanity and good temper." Following the Civil War, Connecticut property ownership restrictions were adjusted and more and more immigrant workers began to make their way to Georgetown. It is not know why but many Swedish immigrants chose the Gilbert and Bennett Company for employment. It is likely that Swedish immigrants were drawn to the Protestant ideals of the factory's management and the skills of the Swedes met the needs of the factory at a very important time in it's history. The Weston side of Georgetown soon became know as Swedetown and the Swedish Church, although altered into a home still stands today. Old Mill/Bunker Hill was the choice of the Polish immigrants, The Italians settled in Branchville, The Main Street/School Street/Church Street section housed English, Irish and French. To the company, immigrants were good, inexpensive labor. To the immigrants, the factory and mills were convenient (within walking distance and rail lines) and the growing village of Georgetown provided all they required in this new world. [Did you know Grape Vine Cultivation was patented in Georgetown (1868) by George Perry? * The company was incorporated 19 days after the fire!! On May 10, 1889 the Old Red Mill was destroyed by fire and a new mill was built in its place*. The Old Red Mill had been used since 1834 by the company. Operations at mill had expanded over the years to include the manufacturing of woven wire cloth, cheese and meat safes, ash sifters, coal screens, and ox muzzles. Tinning and galvanizing also took place here. In a separate building the company made coal hods from 1857 to 1864. The Hod Shop was sold to Connery Bros. in 1913. The Red Mill was being used strictly for the drawing of fine wire, tinning and galvanizing wire in its later years. To serve the needs of these people there were quite a few small markets in the area. Connery's and Perry's market were two of the earliest and most popular. Connery's began in 1882 when Michael Connery bought the general store for $240. The price included everything but the dry goods part of the store, which was purchased several years later. Connery's would serve the Georgetown community until 1973. Other markets of note: A&P, Georgetown Market & Liquor store, Herbert Kearn's Store, Tankus' Clothing store, Sabillia's market & liquor store, Hammelscamp's meat market, Perry had another meat market over by Kearn's store too. At the turn of the century Georgetown came to be known as Georgetown Village. According to an article "Jim Driscoll Recalls Redding's Yesterdays" by Bernard Frazer in the Redding Times, March 27, 1958, in 1908 "there were forty street lights in Georgetown, five times as many as there are now. And they were put there without any expense to the taxpayers. Every night there was no moonlight, a lamplighter would go around and light them, not only in the center of town but on the surrounding roads." These lights "were given by the Georgetown Village Improvement Association. We used to raise money for the Improvement Association by putting on plays in Miller's Hall (formerly Union Hall, re-named after Louis P. Miller, the factory superintendent and owner of most of the land from Smith Road to Route 7). That was located a couple of hundred yards south of the present Georgetown railroad station and was reached by a footbridge starting opposite Connery's store. The plays were put on by the Georgetown Dramatic Society and the time I'm talking about was from 1903 to about 1910 or 1912. We'd put on a popular drama two or three times a year, and we'd take the show on the road, too. We used to go to the Cannondale Grange for a couple of nights, and to the Ridgefield Town House." "One of the things we started besides the Dramatic Society was a circulating library on Smith Street. Thirty or forty of us would buy a book and put them all together in one place and exchange them." Miller's Hall wasn't only used for plays, there were "movies every Wednesday and Saturday, the whist clubs which held parties at various times and the Saturday night dances. There also were the community picnics on summer Sunday afternoons at Life Magazine's Camp Association property in Ridgefield, near Branchville, the place that is now the site of Hidden Valley, the New York Herald Tribune's fresh air camp. Another activity was a once-in-a-while visit to the famous local hermit who lived in a cabin near Cooper Station, a stop on the New Haven railroad between Branchville and Ridgefield." He also left a good endowment to the Fresh Air Farm, later known as Life's Farm founded in the 1890's by John Mitchell (of Life Magazine Fame). Rev. Ursinus O. Mohr, a former pastor of the church and his wife, for most of the time since 1899 were in charge of Fresh Air/Life's Farm which gave a two week outing to about 1200 poor city children every summer. The company erected a school building for the community in 1915 and deeded it to School District #10. The fine up-to-date building was a model for every school building committee to follow, and was a fitting memorial to those who had the best interests of Georgetown at heart. After a lapse of 100 years, the children of Georgetown and Boston districts attended the same school as Georgetown residents who did not live in the "Wilton section" could apply for and be granted permission to attend. In the 1960's this school was operated by the Wilton School Board, school district #10 was discontinued in 1964. The development of New Street accompanied the building of the school by Gilbert & Bennett in 1916. New G&B School, Old Schoolhouse on the hill behind it. Rare view of the G&B Buildings and Portland Avenue in the 1920's. For 137 years the Norwalk River served the company well, until Saturday night October 15, 1955. During the preceding 36 hours, almost 13 inches (12.58 to be exact) of rain had fallen on the 12 square mile water shed above the millpond. As the water gathered in the valley, it formed a tremendous force that washed out bridges, roads, dams, and rushed through the plant- knocking out windows, doors, tossing freight cars, covering machinery, boilers and stock to a depth of 9 to 10 feet. The Flood of 1955 caused almost $1 million worth of damage to the mill. Despite the destruction, the employees and local contractors joined together for a huge clean up effort and the company reopened two months later. Despite the Floods devastation the company still produced 2.6 million miles of wire in 1955...an amount that would reach 104 times around the world. Following the flood plans by the Commissioner of Agriculture and Natural Resources called for several control dams upstream to try and prevent future flood disasters. May 28, 1964 a dinner was held at Luigi's honoring employees with 35 or more years of continuous service. Eric Ericson (35 years), Joe Ellis (35), Eric Swenson (37), Chris Larson (35) Bottom Row- Gus Forsberg (41), Len Taylor (50), Sue Olmstead (46), Joe Therrien (35) Gold wrists were present to all. The heart of Gilbert and Bennett was its employees! They had a great deal of pride and loyalty to the company and community. A quality that is sorely missed in American business today. By 1974 the company has grown to include wire plants in Blue Island, Ill., Toccoa, Ga., and Dunbar, Va., and wood fencing plants in Scotland Neck, NC., and Carney, Mich. Around this time John H. Mulliken's son Alfred was appointed President. Alfred who had been more involved in the Blue Island plant than the Georgetown plant would serve a short tenor as President. In 1975, union labor strikes caused violent encounters between union workers and "scab" workers in Georgetown. The company had begun to step away from its tradition as owners and employees were no longer "on the same page". Note: Alfred's presidency and company information from 1974 into the 1980's is still being researched. At the time of this writing I have not had access to documentation on this time period. Bertil Rosendahl, an employee of G&B for 43 years, has been a great help in providing information to me and it is my intention to further research this era in the near future. James M. Knott, Sr. noted that in 1978, the President of G&B was Caleb Taft. I will post an updated history on the web site as soon as it becomes available. On January 12, 1999, the Environmental Protection Agency (EPA) initiated a preliminary assessment/site investigation, which included sampling of the lagoons, waste piles, and surface soils. During this investigation, EPA documented the presence of high levels of lead and zinc contamination throughout the site. The first school the children of the early settlers of Georgetown attended stood on the west bank of the Saugatuck River at the foot of Nobb's Crook hill a short distance north of where Ferdinand Gorham's house stood in what is now Redding Glen. Which is roughly near the intersection of Route 53 and Route 107, where the Roadhouse is today. 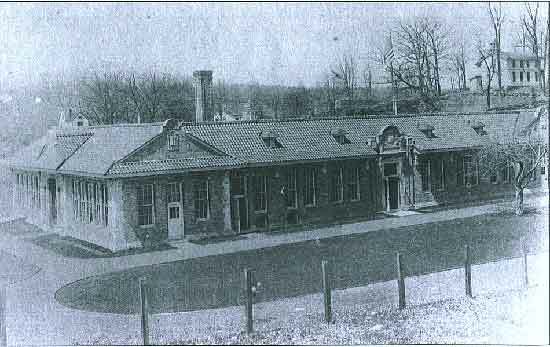 It was one of three schools established by the parish of Redding, town of Fairfield, in 1737, and was known as the West Redding district school. It was a small log structure with rude seats made of slabs and a stone fireplace. The district comprised what is now Diamond Hill, the Boston District and that part of George-town in the town of Redding. The other schools in Redding at this time were called the Lonetown(Redding Center) and the Ridge(East Redding) district schools. In 1767 the town of Redding was organized and in 1768 was divided into school districts. Boston District No. 5 served the children from the section now known as Georgetown in Redding. The schoolhouse was located on Route 107, between Umpawaug Road and Little Boston Road. It was for many years a famous school. Elias Bennett, later known as Post Rider Bennett, was teacher from 1800 to 1815. Nathaniel Perry, Walter Bates, Aaron B. Hull, Gershom Banks, Oliver Dudley, and William Bennett taught in the old schoolhouse later. In the 1850's a second schoolhouse was built on or near the site of the first schoolhouse. It was a great improvement on the first school, where the seats had no backs, a wide board fastened to the wall on three sides of the room formed the desks, and an open fireplace to heated the room in winter. The new school was equip with desks, seats with backs, and a box stove standing in the center of the room to heat the school in winter. In the winter of 1864 Wilbur F. Thompson, the historian, was a pupil in the Boston school and noted: The ages of the pupils ranged from six to twenty years. Many were men and women grown. Teachers in those days had to be men of muscle as well as of brains. Following are the names of the teachers in the Boston District school from 1864 to 1872: winter terms; David L. Rowland, Seth Platt Bates, John Belden Hurlbutt, Ambrose Platt, Arthur B. Hill; summer terms, Sarah Hill and Emma Olmstead. In those days the teachers boarded with the parents of the children who attended school, it was called "boarding around the district." The schools were not free schools as they are today, and the burden was heavy on many par-ents who had large families. Following are names of the pupils who attended the winter term of 1864, giving the father's name also: Orrin Adams' children - Leroy, Imogene, Julia; William Albin's children - Frank, Lydia, Warson, Albert; Burr Bennett's children - William, Polly, Mary, Elmer; Gershom Banks' children - George, Jane, Will; Zalmon Fil-low's child - Effie; Aaron Fillow's child - Fred; Joseph Goodsell's child - George B.; William Gorham's child - Ferdinand; Richard Higgins' children - Richard, John and Ellen; Moses Hill's children - Gcrshom, Deborah, Ebenezer, Mary, Samantha; Bradley Hill's children - Arthur B. and Albert; Burr Hill's children - Helen, Celia, Nathaniel; Edmund Lee's children - John, Margaret, Thornton and Jessie; Henry Lee's child - Frank; Ashur Marchant's children - Joel and Arthur; Aaron Olmstead's children - Hawley, Sarah, Samuel, Eva; Granville Perry's children - Georganna, Eva, Timothy; Parson's grandchild - Hattie; John Rady's children - John, James and Ellen; Peter Smith's children - Eddie and Ruth; Dimon Sturges' children - Oscar and Ida; Edward Thomp-son's children - Wilbur F. and Herbert B.; Francis Welch's children - Mary and Daniel. The ancestors of many who have lived in Georgetown attended school here, as it was the nearest one in the neighborhood. The sale of the Boston district schoolhouse to M. Connery of Georgetown formed the closing chapter in the history of a school that had had an existence of over 150 years. On December 6, 1920 this property was sold to Michael Connery and on March 15, 1921, he sold it to James Driscoll, who used the site to build a home. Parts of the old schoolhouse were used in the construction of the garage. The first school built in The Village of Georgetown was started about 1800; the school house stood near where Walter Perry's house now stands. Not much is known about this school; it was a small building and some of the teachers who had taught in the Boston school taught here. A second schoolhouse, School House No. 2, was built in 1818 and stood on the south end of William Wakeman' s home lot. This also was a small building; it is not known how long school was held here. In 1824 William Wakeman sold his farm to Benjamin Gilbert and bought the Matthew Bennett place on the road to Weston, years later owned by Jonathan Betts which was across from the Swedish Church. Mr. Wakeman moved the little school house up the hill and attached it to the rear of his new house for a kitchen. The third schoolhouse, School House No. 3, stood in the hollow in back of Wilkie Batterson's blacksmith shop on the road to Nod, which today it is the area at the junction of Routes 7 and 107. At this time or later the present school district of Georgetown was formed, taking in what is known as Chicken Street, which at that time was a thickly settled section. This schoolhouse was used until the winter of 1850, when it was burned. A new site was purchased on what is now known as School Hill and the er-ection of a new school was commenced. 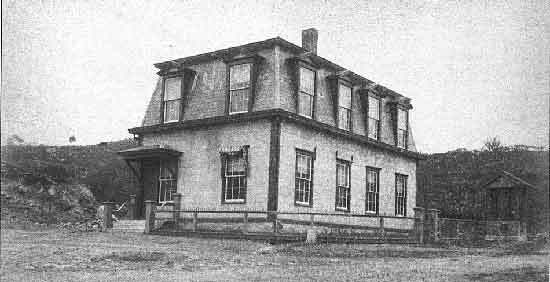 Until the completion of the new building the school sessions were held in Taylor's hat shop, which stood at the top of what was known as Aunt Sal Taylor's hill, on the road to Nod. This shop was later moved and attached to the Taylor home, later owned by William Lockwood *(now the Pfhal house) and is part of the house today. The new school house, School House No. 4 was up-to-date, hav-ing seats and desks. Something new for Georgetown, the old school houses having benches for seats and a board fastened around the wall for desks. Among the teachers who taught in School House No. 4 were Peter Fayerweather, George Godfrey, Lyman Keeler, Charles Sherwood, Miss Sturges (daughter of Charles Sturges,) Miss Margaret Moore, Luzon Jelliff and many others later than 1876. Among the scholars who att-ended school here from 1860-1864 were Francis, Eugene, Aaron, Frank G. and. Lydia Albin; Lester, Ezra P. and William R. Bennett; Frederick Brown; Medora and Allie Batterson; Will, James and John Corcoran; Francis de Garmo and sister George; Charles and John Gould; Mary, George, Eva, Will, Lester, Lucius and Luther Godfrey; Frank and Mary Elwell; Emma and Addie Hurlbutt; Rosalie, Will, Gilson and. little Sid Jennings; Charles, Carrie, John, Francis and. Ida Jelliff; Augusta, Rebecca and Ben Lobdell; Addie, Alida and Joe Lockwood; Ida and Will Lee; Samuel J. and Mary Miller; Huldah, Eli G. and Nettie Main; Ed, Julia and Annie Mills; David, William E., Edmund, Isadora, George, Nettie and William H. Osborn; Charles and Dell Olmstead; El-lza Prior; Jennie Luick; Alice, Lizzie, Ida, Stell and Eddie St. John; Wilbur F. and Herbert Thompson; Frank, Mary and Dan Welsh; Henry Willams; Charlie Wells, and others whose names are forgotten. The School House No. 4 was enlarged many times to accommodate the growing school population. Many persons of years past had pleasant memories of the old school house, surrounded by its fine grove of trees. And many friendships that began there lasted through the long years that passed since they were boys and girls attending school. But the old school house on the hill outlived its day and generation, and School House No. 5 was built by Gilbert and Bennett to take its place in 1915. The Gilbert and Bennett School, was built through the generosity of the factory owners, was a model school for the community. It contained eight separate classrooms, an auditorium, kitchen, and cafeteria, a principal's office and rooms equipped for manual training and domestic science. Built on one level for safety reasons, each room had its own exit door. There were neat inside bathrooms and a spacious playground. *Employees also have to be credited for agreeing to postpone wage increases and bonuses to help finance the school. The fine up-to-date building was a model for every school building committee to follow, and was a fitting memorial to those who had the best interests of Georgetown at heart. And there again, after a lapse of 100 years, the children of Georgetown and Boston districts attended the same school as Georgetown residents who did not live in the Wilton section could apply for and be granted permission to attend. As the children came from three different towns, administration posed a problem until the General Assembly in 1919 created School District 10 to embrace parts of Weston, Wilton and Redding. Miss Ina E. Driscoll came as its teaching principal in 1926 and remained for 31 years (she taught Math). Enrollment ran about 250 pupils. Several residents today fondly remem-ber their schooldays and the kindness of Miss Driscoll whose caring influence extended into their very homes. 1,000 people attended her retirement party in 1957. She became known as the "Mayor of Georgetown" to adults in the community during the depression helping families with food, shelter, clothing all confidencially. She was known as "Old Hawkeye" to the students. A portrait of her by long time resident Roland Mattson hung in the Auditorium, so "Old Hawkeye" kept watch over the students even after her retirement. In 1927 there were 116 Redding children at the school, total enrollment from 3 towns was 300.. The other 3 schools in Redding totaled only 100. Girls out numbered the boys in Gtown at that time with 68 girls and 48 boys. By 1936 enrollment was down to 149. School was at times referred to as having a "chicken wire curriculum" for it's affilliation with G&B. Instead of paying for participation in the National PTA association they used the money they saved to purchase a motion picture camera to film students and events. One longstanding school custom required that each girl in the graduating class design and sew her graduation dress. This white dress would later be worn at confirmation time. Another tradition was the annual Swedish smorgasbord of home-cooked foods, a fund-raising affair to provide special extras for the school. 1958 was the first year without a graduation class. Because there were only 6 grades with the completion of Redding Elementery. Because of the nearby railroad station, most of the "G&B" graduates went on to further education at Norwalk High School, or to trade and technical courses in Danbury. The low building with its Spanish tile roof and pretty playground was later sold to the Landmark Academy, a private school. In the 1960's this school was operated by the Wilton School Board, school district number 10 was discontinued in 1964. A trust fund established in 1906 by Edwin Gilbert, son of the mill founder, has now been re-activated to benefit children who reside in the former School District 10. 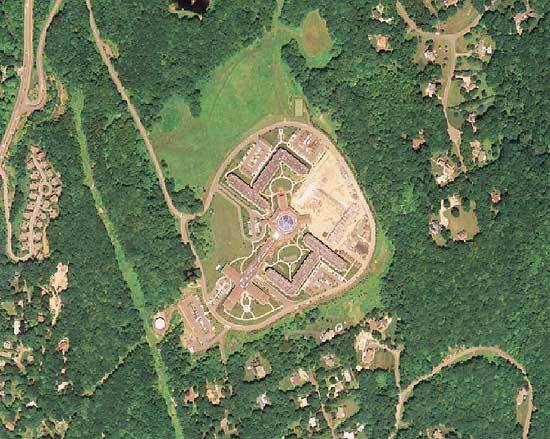 The Connecticut Agricultural College owned a farm in Georgetown? Edwin Gilbert of Georgetown, this state, who died in Crescent City, Florida, February 28, had been much interested in the work of the Connecticut Agricultural College, (Now UCONN) and under the terms of his will the college will receive a bequest of $60,000.00 besides Mr. Gilbert's large farm with its stock and buildings." *The above information was compiled and forwarded by Ms. Betsy Pittman of the Thomas Dodd Research Center. The $60,000.00 was actually 1,200 shares of G&B Capital Stock worth $60,000.00. The college could only use the dividends of these shares... they could not sell the stock. *The information below was revised with the help of an rare copy of The Connecticut Farmer from 1910 which was forwarded by Mr. Paul Scribner of Georgetown...I can't thank him enough. In 1721 Robert Rumsey of Fairfield bought of John Applegate a large tract of land known as the Applegate long lots. In 1724 he willed it to his three sons Robert, Benjamin, and Isaac, who built homes on the tract. Isaac built on the hill in front of where the Aaron Osborn house stood. The location of the Aaron Osborn house was across the street from the present driveway of the Meadow Ridge Facility which would make the house that Isaac built the first documented building on this tract of land. A complete and verifiable list of property owners from 1724 to 1800 is not available but it is known that Thaddeus Perry settled in this area and by way of marriage Elias Bennett (he married Mary, the daughter of Thaddeus Perry), received land on this ridge in the early 1800's thanks to the writings of his descendant Wilbur F. Thompson. Sturges Bennett, Eli's son, inherited the land (now known as Goodsell's Hill) and employed Ezra Brown to work his farm there. It was originally thought that Edwin Gilbert received the farm from Bennett when Sturges passed away in 1876 (the reason being Bennett was a brother-in-law and partner at G&B). However, recent discoveries have uncovered the truth. The Gilbert Farm was actually three farms Edwin Gilbert purchased between 1894 & 1895. In addition to the Bennett farm of 90 acres which Gilbert purchased from Edward Schultz, two other adjoining farms were also purchased: Hog Ridge Farm (50 acres) and John Hohman's Farm (216 acres). The three farms along with additional property acquired later were consolidated in 1903 to total the 365 acres willed to the Connecticut Agricultural College in 1906. At the age of 80 when he had relinquished some of the active duties of his successful business, and had more time to read and think, he became interested in Connecticut agriculture. He thought about the agricultural conditions of his boyhood days, when the hills of Weston and Redding were covered with cattle growing into beef. Connecticut had grow into a manufacturing state, and the population to be fed had multiplied many times over. Yet the Connecticut farmer did not prosper, instead he purchased his beef like everyone else - from the butcher. Beef was shipped to Connecticut thousands of miles from the west by railroad. With western farmers complaining freight costs were higher than what they received for their beef and Connecticut farmers complaining about the high cost of beef. Gilbert found this to be all wrong. "Hundreds and hundreds of acres of good grazing land lying idle in Connecticut and we are paying the railroad companies for the meat we eat. Why not use these pastures, raise grass and corn on these hills and produce the best beef at the market's door?" He corresponded with the U.S. Department of Agriculture and the experiment stations, studied their reports and decided 'I will do it. I will show the farmers of southwestern Connecticut how to raise beef as good as can be bought in any market.' He bought three cheap farms on Hog Ridge, built barns that would accommodate one hundred head of cattle, and two large silos. He started a herd of Hereford cattle and encouraged a force of 30 men to improve the farm. Arthur J. Pierpont visited him in 1895 and Gilbert remarked: "Mr. Pierpont, there's lots of money in farming, but so far, I have found that it has been all on the left-hand side of the ledger." Edwin Gilbert became very enthusiastic over is cattle, swine and crops. Having learned of the Connecticut Agricultural College he sent for the president and trustees to visit him. He realized that he was an old man that had undertaken a grand project and was anxious to ensure the work he had started would continue after his death, he asked the trustees if they would accept his farm, with stock and tools, and maintain it as a practical farm to help the local farmers. The trustees replied that they were interested in agricultural education and would do the best they could with whatever was placed in their hands, but could not divide the Storrs institution or teaching force, nor use state or government funds at Gilbert's Farm seeing those funds were appropriated for use at Storrs. When Edwin Gilbert passed away in February 1906, The Gilbert Farm and property was willed to the Connecticut Agricultural College (The Connecticut Agriculture College would later become UCONN). Under the terms of his will the college received 1,200 shares of G&B Stock in addition to Mr. Gilbert's large 365 acre farm with all its *stock and buildings. *There were about 70 head of cattle, 40 pigs and five caretakers. The Gilbert Will provided that the property could not be sold but must be maintained as a farm for instruction in practical agriculture...The company stock was off limits too: ".... I do further give to said college 1200 shares of the capital stock of The Gilbert and Bennett Manufacturing Co. Said stock not to be sold and the income (stock dividends) thereof devoted to the care of the real estate herein devised, and instruction in the science of farming as taught by said college, and especially the raising of and caring for livestock." "...There was great consternation among the trustees. Can we legally accept the gift? Just what did Mr. Gilbert intend us to do? Are we to run an agricultural school here under the direction of the agricultural college at Storrs? Are we able to carry out Mr. Gilbert's desire? Will we not make a failure of it and be severely criticized for having accepted it? Situated diagonally across the state from the college how can it be under the same management? In traveling from one place to the other, one must pass through six counties, out of the eight in the state. The trustees held meeting after meeting debating what to do, but some stuck to the fact that it was given to us in good faith and the only thing that we could do was to accept it and do our best to carry out Mr. Gilbert's will as we understood it. Therefore the gift was formally accepted April 23, 1906 to be maintained as a farm and department of the Connecticut Agricultural College." "There were about 70 head of cattle, 40 pigs and five caretakers, without a bit of hay or grain, not any income from the farm and not a dollar did the college have that could be used here. That was the first proposition we had to face. Here was a state farm, that the papers had portrayed as a model farm, neighbors expecting to see an agricultural school loom up, watching our teams, cattle and crops, criticizing every movement as "the way the agricultural college does things." College authorities were supposed to be superhuman, infallible, running a state farm for demonstration purposes yet as poverty stricken as any young farmer ever started in business." "We began selling off pigs, steers, oxen, cows, a few at a time so as to pay the men, and feed the remaining animals, and as the income thus received was used up, we had to let the men go one at a time until only the foreman remained...then he resigned." Whenever we bought , the price was held high because the state was rich. Whenever we had to sell the price offered was low, because it was the state and could afford to sell cheap." "After disposing of everything but the registered Herefords and the cows that looked like good milkers, we borrowed a separator and began selling cream to Mr. Hawxhurst in Norwalk, thinking of all of the improvements we could make from the profits on the cream. It reached him sour a few times and he decided he did not like College Cream, and when he hears of the Connecticut Agricultural College today, I presume it suggests to him sour cream." "We were living in anticipation of the August dividend we were to receive. It came. The administrators took part to reimburse them for the expense of maintaining the farm from Mr. Gilbert's death until accepted by the trustees, and the state treasurer took most of the rest as an inheritance tax. Of the 20 prize steers, which Mr. Gilbert had purchased the fall before, at $50.00 a piece, fed and cared for all winter, we sold for $50.00 a piece in the Spring, eight were found badly affected with tuberculosis, so we had our whole herd tested and 15 more responded. We have tested twice a year since and now have a clean herd that we are proud of. After the test we had cows enough to produce about 20 quarts of milk daily." "It was reported that the people of Georgetown were bothered to get enough milk, so Mr. A.B. Clark, a graduate of the college who lived here by himself one winter, and was farm superintendent, dairyman, herdsman, cook, and all the other titles, and I, started out and canvassed the town, asking every housekeeper if she was getting milk enough. Some gave us the cold shoulder, some said they would want an extra quart on Thanksgiving Day, and a few families that other milkmen for reasons other than their own did not furnish were glad of a chance to trade with us. The following morning Mr. Clark started out with a mule and an antique sidebar wagon and sold twelve quarts. We were very careful the first day not to ask anyone to trade with us if they were being supplied elsewhere, and from that day to this we have never solicited a customer, and have not lost four dollars in milk bills in four years. With the rapid growth in the population of Georgetown, they now demand of us nearly 200 quarts a day. The rest is shipped to a nearby city where it finds a market at 12 cents a quart." "A petition was sent to legislature by jealous milkmen and their friends, to prohibit us from selling milk, but the consumers in Georgetown, having children depending on pure milk, sent in such a strong counter petition that the original petition was never presented." "Our greatest annoyance was procuring water for the stock. We had three sources: the bucket that hung on a rickety curb over the well at the house, carrying in a pail from a spring below the barn or pumping by hand from the pond. That pump would require 24 hours running to supply the water we use at the present. A little money and work gave us a never failing supply of the best of spring water flowing through the house, barn, and dairy, and the wind does all the work and we have all the wind left that we need for other purposes." "We purchased a few good dairy cows, raised a registered bull calf from the college herd, have saved our best calves and grown up the present herd." "Mr. L.C. Root (milk inspector from Stamford) objected to our keeping pigs under the cows so we cleaned up the pig pens and used them for sanitary milk rooms. You will notice in all of our improvements the absence of show, we have endeavored to do things right, with as little labor and expense as possible." "The Gilbert Farm at Georgetown, Connecticut is a department of The Connecticut Agricultural College of Storrs, Connecticut. We wish to make this farm a practical farm; a place to demonstrate the science of agriculture as taught by the various departments of the Connecticut Agricultural College; an exponent of new agricultural truths, learned at the experiment stations and taught by the agricultural colleges; a place where new up-to-date methods advised by the stations, where trained scientists are constantly studying to help the farmers, may be tried out and reduced to practical working methods. I am not telling you what the farm is, but what we hope to make it. A place where the farmers in this corner of the state, which is a considerable distance from the college or either of the experiment stations, can bring milk to be tested for fat, bacteria, acid, puss, ptomaine, etc... Learn about separators, feeding formulas, tuberculin tests, common ailments of stock, seeding mixtures, fertilizer mixtures, spraying methods and effects, sheep industry, forestry treatment of pasture lands, etc..."
"The college at Storrs has trained experts teaching nearly every branch of agriculture that is useful in Connecticut. We wish to build up this farm not according to my ideas or those of Superintendent Cook's or those of any other one or two men but by the ideas and advise of the various professors at Storrs. Prof. Garrigus selected and purchased the sheep; Profs. Beach and Trueman have advised in remodeling the stable and dairy plant; Profs. Stocking and Esten gave us the secret of producing clean milk, which milk has brought renown to Gilbert Farm at three milk exhibits of the Dairymen's association held at Hartford. Last winter it was the only milk exhibited scoring 98, and the two previous years had far less bacteria than any other exhibit. Dr. Lehnert testing the herd and showing us how to eradicate tuberculosis. Prof. Wheeler surveyed the farm and laid out the ice pond and road." "We do not intend to enlarge the dairy plant further. We developed that first, because the farm was nearer ready for dairying than for any other branch of farming, and we hoped by that means to bring about some income. This year (1910) we are building a road to the village that will not exceed a 6 and a half percent grade, so as to make the farm more accessible, and a shed for wagons and tools. Then if we continue to receive dividends from our stock we will be ready to take up beef, pork, poultry, orcharding, forestry, etc... under the direction of the various departments of the agricultural college." "Of how great value this farm becomes to the agricultural interests of Fairfield County depends entirely on how much you demand of it and how much you demand of it and how much you avail yourselves of its resources. Mr. Gilbert gave liberally. The custodians of the funds he left have caused them to bear much fruit. The college authorities are anxious and willing to do all in their power to help. The farm is now self-supporting, and whatever dividend we receive will be devoted to permanent improvements and endeavors to help the agriculture of the state, especially this community. Making money is not the object of this farm, but we wish to do things right. Visit us often, criticize us freely, listen to our explanations before condemning us. You may learn more from our failures than our successes, and let us pull together for the promotion of agriculture, and be proud of our calling." "The management of the Gilbert Farm, has arranged for a series of meetings. These will be held on the first Friday of each month at the farm and will be a continuous object lesson of the possibility and practicability of the appliance of up-to-date, progressive methods and equipment. At each meeting one of the professors from the Agricultural College will be present to talk on his specialty, and to demonstrate what has been done in that specialty at the farm. The next meeting will be held on Friday, December 1, and H.L. Garrigus of the college will talk on horses and sheep. A representative of the DuPont Powder Company will also give a demonstration in the use of dynamite on the farm in removing rocks and stumps, digging ditches and sub-soiling. - Arthur J. Pierpont of Waterbury on September 2, 1910. Pierpont was one of the leading Dairymen in the state of Connecticut and trustee of the Agricultural College. 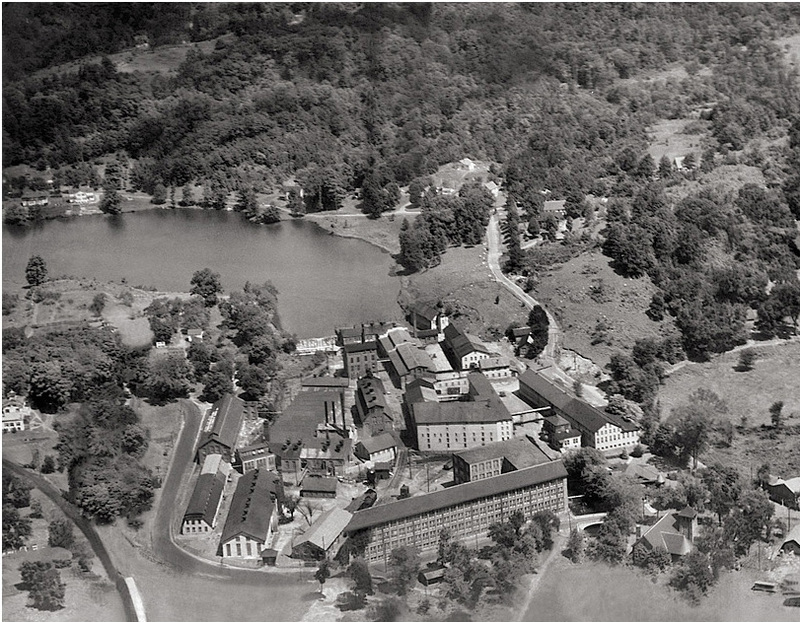 [*It is believed that the farm was in operation by the Agricultural college up until 1916. It's noted that: "The college continued to operate the farm under the terms of Mr. Gilbert's Will but the farm school idea was abandoned at the outbreak of the war and was never revived. Unfortunately the approaching war turned attention to other channels." It has also been noted: "The trustees of Storrs, Connecticut College and University of Connecticut, successively, have found the property to be a white elephant on their hands. Steps were eventually taken in the 1920's to dissolve the trust." Following the farm's abandonment by the school, Edward Bigalo worked the farm until 1925, it was in that year Wesley Robie of Wilridge Road, revived the farm and sold dairy products to local residents. "I did most everything, milking, feeding, and various other things," said Mr. Robie, and he was usually up at 4:30 in the morning. He ran the farm until 1946. Raynor Moves in... Lindbergh Flies in? The total area of the property was 255 acres, 87 in Weston and 168 in Redding. In 1967, 125 acres of the Redding land were zoned for industry. The next land transfer was in 1973 from Welt & Zerweck to the Las Olas North Company whose principal partner was John R. Bartlett, who was the developer of the adjacent Fairview Farms. Barwil, Ltd. Was added to the list of owners in 1974. Dimes, Edwin K. Trustee of Westport bought the property in 1978 . 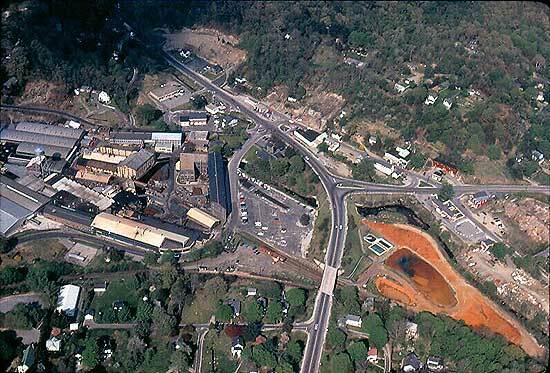 The property was transferred to Georgetown Properties in 1982 for the construction of Glendinning's corporate headquarters and development of five other lots for corporations to rent. Georgetown Properites had broken ground in 1980 so they were likely affiliated with the Trust company in some capacity. Mr. Raynor continued to live at his home despite the construction on the property and was there until the 1980's. In 1984 Perkin Elmer Corp. bought the property for the construction of its headquarters and we all know who the current land owners are ...Meadow Ridge has a beautiful facility on the farm land today. Pictures of the Farm are here. Four-hundred Georgetown residents in May, 1984 signed a petition protesting the realignment of mail service in the area. The Postal Service had announced that it would close the Georgetown Post Office and Georgetowners would receive mail service from post offices in the municipalities in which they lived. Eventually, the Postal Service went for another idea: build a new Georgetown Post Office and offer post office box service. 1976 was the first scare for Georgetown Residents regarding their mail service. The Post Office Department did a survey out of their Stamford office asking about potential changes such as closing the Georgetown Post Office. The result was NO! All of the people in Redding did not want to see Post Office changes, they wanted their own post offices to stay the same, but they all wanted to see Post Office changes "somewhere else". *Not in my backyard is nothing new. Prior to an official Post Office, Redding and Georgetown were serviced by Post Riders. Post Riders were real rural deliverymen, performing all the services of today's post offices and then some on horseback! Turney Foote was the oldest known Post Rider currently on record, his route was purchased by Elias Bennett (Sturges Bennett's Father. Sturges was the Bennett in Gilbert and Bennett). Elias Bennett was born on Christmas Day 1778, which happens to be the same year General Putnam's troops wintered in Redding. Elias taught at the Little Boston School from 1800 to 1812 and married a Perry girl prior to obtaining Turney Foote's route. He served as the post rider for 33 years, retiring in 1845. He made weekly trip to Bridgeport as the Bridgeport Farmer was the most popular paper of his customers (400 of 800 customers subscribing to it). Many have asked about the History of Redding logo: who is the man on the horse? is the common question, Elias Bennett is the answer. Post riders were amazing individuals, imagine picking up, sorting and delivering mail, newspapers and many other things to 800 homes, in multiple towns, on horseback, in rain, in snow, in hot, in cold, in all sorts of weather...not to mention keeping track of it all once you got home!! Connery's Store, Michael Connery purchased business from G&B in 1882 for $240...he wanted a $25 raise from G&B to run the store (it was originally the company store for G&B employees) but when his request was tunred down he opted to purchased the store. Harold Connery took over for his father and ran the store until 1967 when he sold it to Ed Conklin and Erwin Samuelson. Ed and Erwin remained owners until 1973. 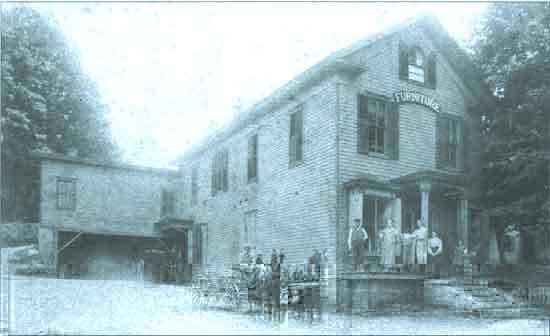 It housed several businesses until the present time, including Sloper Real Estate, and now is back in the hands of the Connery Family as Curves for Women. This building location has much significance to Georgetown's history in that it is the location of Gilbert and Bennett's Old Red Shop, the first building G&B would operate out of as a business partnership. The original Old Red Shop building was torn down by Sturges Bennett in 1869. Perry's Meat/Fish Market, Nathan Perry, Walter Perry, Axel Carlson, owners over course of its history; Clinton Bennett worked there. The building is still on Main St. just altered so that the doors and windows that used to be on the end of the building facing Main Street are now on the side of the building facing Rt. 57/Old Mill Rd. Currently it the Redding Pilot office which does not appear to be original Perry's Market building given the dimensions of the building currently, this building, however, does match the building that was in use as Perry's Market in the 1950's. Fish came in on Thursdays and if it hadn't sold by Saturday night it was taken out to the community and given to the less-fortunate. Kearn's Store, Herbert Kearns, known as "Bert". Store established approx. 1906. The Store had a make shift Barbershop on the 2nd floor run by Charlie Samuelson on Saturdays and holidays…mostly Swedish clients. Kearn's was a classic country store where you could get just about anything. The first location was up by the Post Office today, then it moved down to current Rt. 107 path, in mid-1955 building was moved 30' to 40' (location of veterinarians office) to make way for Rt. 107 construction. Kearn's was nearly bankrupted by the flood of '55. Bert died soon after of heart failure and his wife and son continued to run the store. Back when Bert was a bachelor he drove a Stutz Bear-Cat which was a hot rod car of the era. Herbert Kearns was adopted by Smith family of Brookside Rd. which explains how he moved from 2nd house in from Rt. 107 at #23 Brookside to #9 Brookside, the former residence of the Smith family...it also explains the first location of his store at the corner of Portland and Brookside. Sabilia's Groceries, Fruits & Vegetables, Ice Cream & Candy, Joe Sabilia and "Mamma Joe", the Peanut Lady, proprietors. Joe ran the fruits and vegetables, Ice Cream and Candy store and Mamma Joe used old orange crates to roast peanuts over. She roasted them right on the side of the road. Then she put them in small paper bags and walked (sometimes rode on horseback) the roads of Branchville, Georgetown, Redding selling them. She followed different routes selling these snacks. She was, as it were, the walking forerunner to the Good Humor Truck, given her popularity with the children and the distances she traveled…as far as Ridgefield, Wilton and Redding Ridge. The peanut business was profitable and about once a week she would travel to the savings bank to make a deposit. Like many women of that period, especially Italians, she wore about 6 layers of skirts with pockets in each. In the bank she pulled up about 4 layers of skirts, found the money and savings booklet, made the deposit and then buried the booklet back in her layers. Sabillia's also ran a Liquor Store which they sold to Dan Levkoff in 1959 (currently Georgetown Liquors, Joe Levkoff, proprietor). Georgetown Market. The Georgetown Market was established in 1922 by Guiseppe Bonsignore. Guiseppe Bonsignore arrived here from Sicily in 1905, young and eager for the American way of life. With him was his wife, Guiseppina, and his infant son, Nino, the first of their five children. Lived on Peaceable St. worked a laborer/caretaker early on. *Sicily was where Ancona's and Caraluzzi's came from too. In their store, Guiseppe and Guiseppina sold everything. Aside from the usual drygoods and foodstuffs, they dealt also in pots and pans, hardware, clothing, and boots. As soon as they were big enough to see over the counters, their sons: Jap and Mondo were helping at the store. This early exposure to marketing gave the boys practical knowledge and some vivid memories. Jap laughingly recalled the widely varied array of merchandise in the tiny store: "Big stacks of kettles set around oil cans on the floor. It wasn't unusual for my father to stick a stiff pair of rolled overalls in a bag along with potatoes. Or a fur cap in with the onions." In 1928, the store moved to its Main St. location. Jap and Mondo took over the business after their father's retirement in 1939. Under their friendly proprietorship, the market has continued to grow and prosper. They later enlarged to include the adjacent G&B Liquor Store (now Lombardi's Pizza, though the original Liquor store was where the Ice Cream Shop is today). Jap was tall, dark-haired, and always pleasant. In his own quiet way, he was a human dynamo, and seemed to thrive on hard work, The busier he was, the happier he appeared. Like Jap, Mondo was tall and dark, but of stockier figure and more outgoing in nature. His animated personality pervaded the store, as did his booming voice. A conversation with Mondo was half the fun of a visit to the market. Flood Stories: The most serious setback the market ever experienced was the flood in October of 1955. The Bonsignores lost everything, quite literally. Not only were all the foods spoiled through submersion, but all the machinery, such as refrigerators and meat grinders, were ruined beyond repair (water was eight inches from the ceiling of the store). The final blow was discovered the next day. Inadvertently, all the week's receipts had been left in the store, and were carried away on the flood tide. But the Bonsignores proved themselves heroes that storm stricken night. Jap received a call late at night, telling him that the flood was rising and he'd better get down to the market immediately. *Mondo lived on Highland Ave at the time and was likely more aware of the situation. He waded down Route 53 and met Mondo at the store. At that point, the floor of the market was under water. A young family (Hansons) lived in the apartment above the store. Realizing that they would need help in getting out, Jap and Mondo made their wet way over to the Georgetown Fire Department to get a rowboat. Forty minutes later (currents were so strong it took 40 minutes to cross Rt. 107!!! Think about how short a distance it is from the Firehouse to the Market), when they arrived back in the boat, the water was eight inches from the ceiling of the store. With the boat, they were able to rescue the stranded father, mother, little boy, and six-week-old infant from the upstairs apartment. Mondo spent the remainder of the wild wet night sleeping on a billiard table in Georgetown. Jap rowed home, up Redding Road. He found his wife, exhausted with worry and waiting, sitting holt up right, fast asleep with her head against the cold windowpane. When asked if he could remember any other serious obstacles the market had encountered, Mondo laughed and said, "No, not unless you want to count the floor-pacing during the depression!" A&P Market, Gustav Johnson, proprietor. Route 107 construction led to removal of this building and business. It was located just east of the Georgetown Bible Church on the path of Rt. 107. Georgetown known more as "a village not a town" prior to the coming of the Rt. 107. The construction bridging Rt. 7 with Redding in a more direct route. Before this time Georgetown's Main St. was the main route to Redding…then known as Rt. 53. Nick Santenella's Barber Shop, Don Sansevieri's Barber Shop (Don's sons are Fran/Fred. Barbershop had a pool room and 2 pool tables), Sanfilipo also had Barber Shop on Main St. at one time. J.C. Driscoll's Real Estate, Steve's Bakery, Local Shoemaker Patsy LoPresti, Georgetown Electric (sullivan), William Henry Colley's Blacksmith shop. Billy Darragh's Calso Gas Station, Wallace Williams' Jewelry Store with Western Union on 2nd floor. Harold McCarty's Garage (Unger Professional Bldg. side), Robert Knight TV repair shop, Hammelscamp Meat Market (later moved up to Pocahanas Rd/Rt. 58), Tankus' Clothing Store, Stocking's Dry Goods, Georgetown Liquor, Mama Rosa's, Connery's Hardware, Building Supplies and Lumber (later DeLuca Bros. and Sloper Lumber), Sam n' Skip's Variety (news and lunch counter, Sam and Vera Bell). Use of Horse and Wagons: Sam Harco used to come to Georgetown on horse and wagon from Wilton to pick up groceries at Bonsie's Georgetown Market, afterward he'd walk over to Fogarty's and his horse "Tom" would pick him up there later. They said the only thing Tom didn't do was help him into the cart. Many Market/Serviceman of the day used horse and wagons even into the auto-era due to the horses knowledge of the routes and the convenience of being able to walk from house to house without having to get in and out of a truck…the horse knew where to go and would follow the deliveryman without much instruction. Orders would be taken from homeowners in the PM and delivered to homeowners in the AM. Many Market/Servicemen came to Gtown from surrounding towns, which makes the number of stores in Gtown even more amazing. Ice Men- Goetjen and Monroe; Monaghan- sold fish; Aidrean Carbonie delivered fresh bakery goods late at night/early in the morning; Locally Connery's delivered coal with "table horses"; Meeken picked up laundry; Gus Churchill delivered dairy products. The Bars of Georgetown. Fogarty's, Benny's, Georgetown Saloon. Forgarty's Georgetown Restaurant had a long, mirror backed bar that greeted you almost immediately as you entered the bar room. It was more or less a half rectangle in appearance. The bar room itself wasn't all that wide as the wall that separated the bar from the seating area only offered a space about 2-3 feet from the bar stools to pass thru if you were heading to the back of the bar. It was popular with the G&B workers, though a bar crowd heavy in Swedes and light in Irishmen or heavy in Irishmen and light in Swedes resulted in some tension. After Jack Forgarty, Danny Crowley ran the Georgetown Restaurant in the 1970's-80's. Later became Georgetown Chowder House. Serafino Docimo owner/operator. Benny's Restaurant. Benny Allegrazzie found the 3rd time to be a charm. After 2 initial attempts at Bar/Restaurants in Branchville and on Route 7, Benny came to Main St. Georgetown. According to my grandfather, Benny's Restaurant attracted a different bar crowd than Forgarty's, it was reported to be a tad on the wild side. Benny's bar was on the left hand side (current seating area of the Saloon), a very plain bar set-up originally. My grandfather also noted that Benny's wife was the boss…she would come out from the kitchen with a broom cocked and ready if anything got too out of hand. The Carlson's who lived on Highland Ave. reported a bullet piercing their home that came from Benny's…it wasn't a shoot-out just someone who got over excited and fired off a round while "whooping it up". Benny's son John recalled a motorcycle being driven into the bar room one night. Guilino and Tony DeLuca later owned and operated a business here, though the timeframe and name is not available at the moment. They remodeled the bar and restaurant areas (pre-saloon timeframe) and kept the bar open on the left hand side while he built the bar room on the right hand side placing it where we find it today. Once the new bar was completed, the old bar was closed/removed which opened that area for restaurant seating. * Benny's daughter Claudia also ran Sweets Shop here and Unger's first dentist office was once here too. Up top, "Rocco" ran a pizza restaurant. He had a wood oven and produced very good pizza. In 1978 the Georgetown Saloon was established, Adam Lubarsky, Tom ("T") Kolkoski, and Stephen Alward owner/operators (almost positive Steve was the Chef). They had great timing and foresight in bringing a country-western bar scene to Georgetown three years before "Urban Cowboy" starring John Travolta resulted in Country becoming "the in-thing" across the U.S. Even today walking thru the swinging doors of the Saloon is like crossing the border into Texas! Many lived above the saloon building in the apartments…Percy St. John was one of the most colorful characters to call the building home. He had many home remedies, and a recipe for a long life that included not drinking, not smoking and going to bed every night at 10 pm, which must have been difficult living above a country-western themed bar…he did live into his 90's though. Her farm was known as "Jean's Farm" and the store she was going to in Georgetown was likely Connery's Store. Audio 7- Bertil Rosendahl on Boy Scouts in Georgetown. Audio 9- Georgetown Village and the community spirit it once held. Percy St. John's "Home Remedies"
Thanks to Lynne M. Barrelle you can now download all of Wilbur's articles here. You can also download the complete history of G&B here. Page Sponsor: http://www.itsmineusa.com Don't lose your stuff..label it!